These Rice Krispie Treats are the BEST! 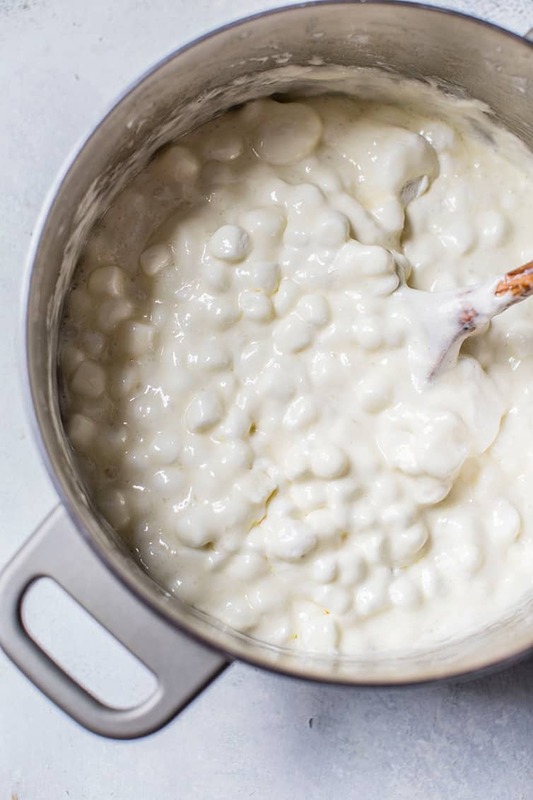 This recipe turns out huge, perfectly soft and gooey rice krispie treats with extra marshmallows mixed in! This will be your one-and-only go-to recipe from now until eternity. I have loved rice krispie treats for my entire life. 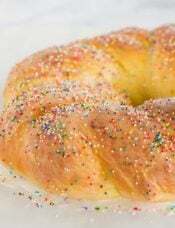 We didn’t have them all the time, but I LOVED them when my mom would make them or I’d go to a birthday party where they were served. Then, the individual packaged treats came out and THOSE were a wonderful splurge when I could snag one. 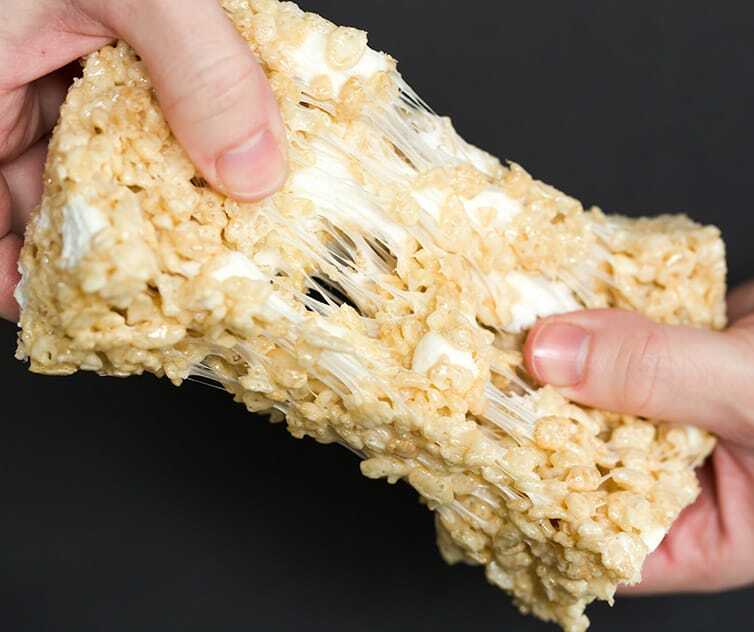 THEN they made rice krispie treats CEREAL. Do you remember this?? My little mind was blown. We weren’t allowed to have sugary cereal at home, but I distinctly remember going to the beach with my family the summer after 7th grade and when we went to the grocery store to stock the efficiency we were staying in, my mom let us pick a “fun” cereal. You better believe I ate rice krispie treats cereal every single morning of that vacation. 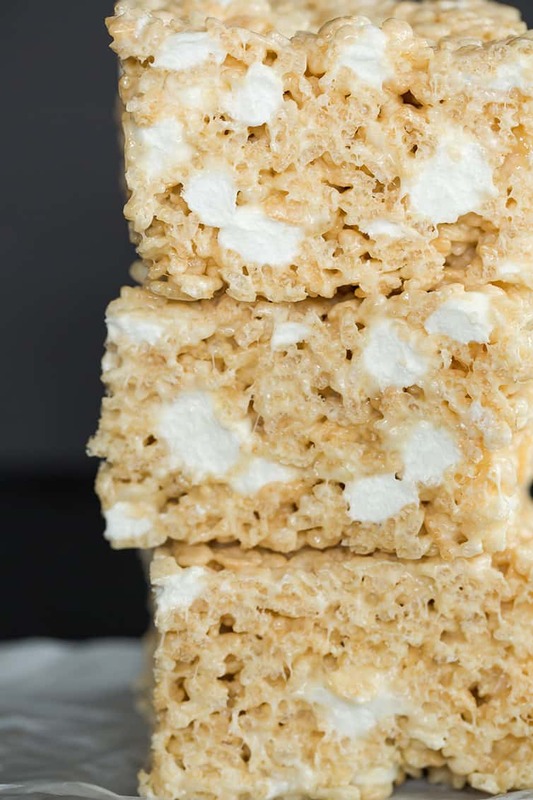 I’ve made countless rice krispie treat recipes over the years, but still hadn’t found THE ONE when it came to plain and simple Rice Krispies treats. I earned for those huge, pillowy soft and gooey treats you find at bakeries. Well, this is absolutely it. Hands down, 100%, best ever. 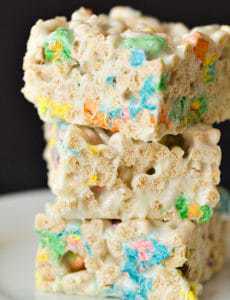 There isn’t a huge secret ingredient or earth-shattering method to making these the most amazing rice krispie treats you’ll ever have; it’s all in the butter/marshmallow/cereal ratio! 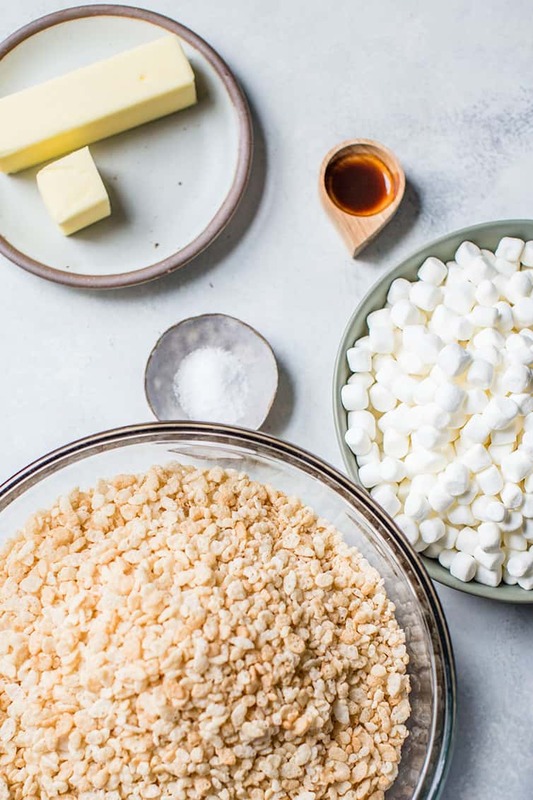 So while we double the amount of cereal (because we want to make huge, bakery-style treats), we QUADRUPLE the amount of marshmallows (and throw in ANOTHER 4 cups of non-melted marshmallows for extra pillowy gooeyness) and increase the butter by 3.33. 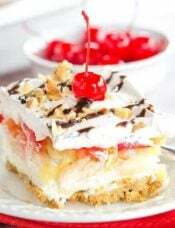 The secret is all in that butter and marshmallow sauce! 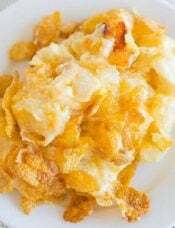 Plus, I throw in a tiny bit of salt and vanilla to amp up and balance out all of the flavors. Now this, this is perfection. 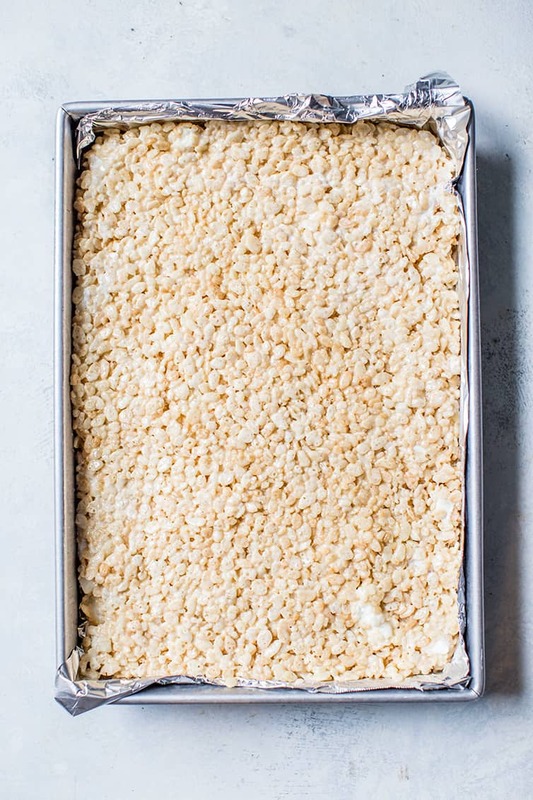 I tweaked the recipe from Cookies and Cups to make a large pan full of enormous Rice Krispies treats, and they are always, without exception, met with rave reviews and requests for the recipe. 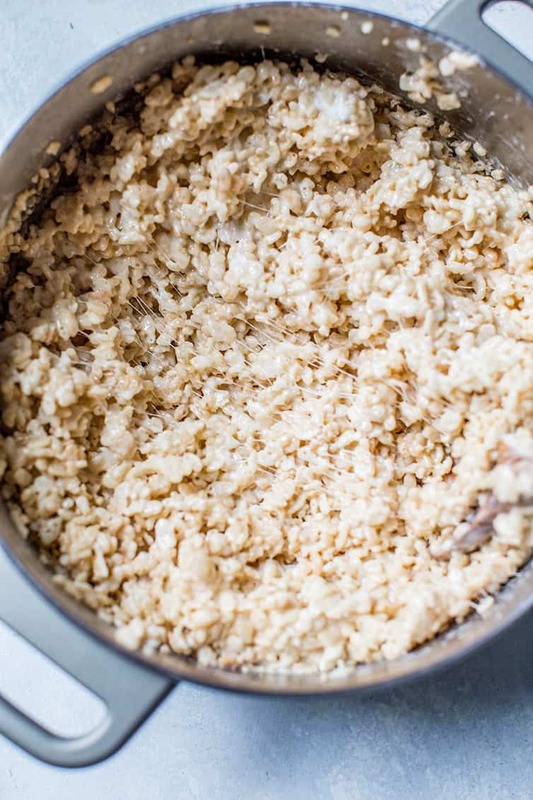 You can make rice krispie treats with marshmallow fluff if you’d like. 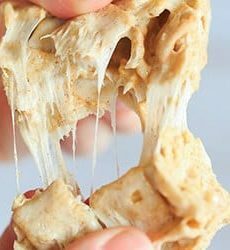 You will need to substitute four (7.5-ounce) jars of marshmallow fluff for the 16 cups of miniature marshmallows that are called for in the recipe. Heat the marshmallow fluff with the melted butter over low heat and proceed with the recipe as directed. How to Store Rice Krispie Treats – They are best stored at room temperature in an airtight container to keep maximum freshness and softness. You can go one step further and wrap them individually in plastic wrap to keep them REALLY fresh. I do not recommend refrigerating them, as they become hard and lose moisture. If you want to freeze them, wrap them individually in plastic wrap and place in a freezer ziploc bag and freeze for up to 2 months. Allow to thaw at room temperature. Note that I made all of those other versions before these best-ever ultimate rice krispie treats came into my life. 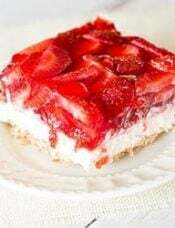 I would 100% base all of those on THIS version with the same butter/marshmallow/cereal ratios used in this recipe. 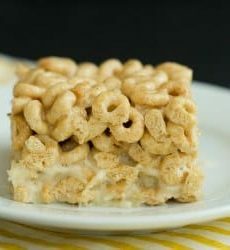 QUESTION: What’s your very favorite version of Rice Krispie Treats? Plain and simple, or with a special twist? 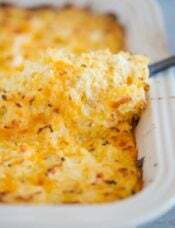 Update Notes: This recipe was originally published in May 2016 and updated in October 2018 with some new photos, a video, and extra recipe notes. I made these rice krispie treats for my son and daughter in law’s baby shower. The theme was Mickey Mouse so I used a Mickey cookie cutter. I wrapped up the scraps for us to eat later. Well everyone was SO in LOVE with them that we ran out. I made 48! When they saw my stash of scraps they didn’t care that they were just leftovers of cut outs. These are by far the absolute best rice krispie treats ever and I have been making them wrong for many years I guess! 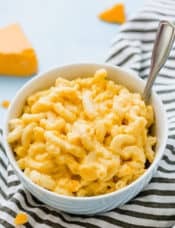 Followed the recipes exactly and wouldn’t change a thing. Cannot wait to try your other recipes! !